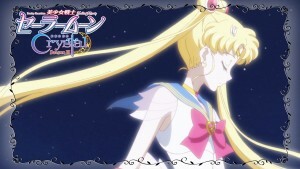 The latest episode of Sailor Moon Crystal aired on Japanese TV Monday May 16th at 11pm Japan Standard Time. Afterwards it was streamed on Crunchyroll, Neon Alley and Hulu starting at about 10:30am Eastern Time. This week we get Act 32, Infinity 6 – Three Guardians. The gang is mostly all together and we get a ton of back story about Sailor Pluto and Hotaru. We also face off against the last of the Witches 5. Things are advancing quite a bit now as we’re over half way done the Infinity story arc. First things first. 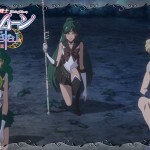 Sailor Pluto is back, and we get a bit of an explanation as to how. 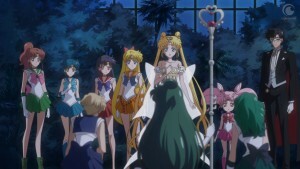 Pluto immediately recognizes Sailor Chibi Moon and knows her as both Small Lady and Sailor Chibi Moon. 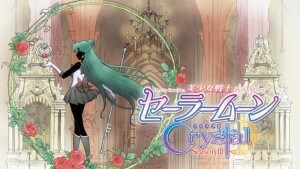 This means that the Sailor Pluto we see here has the same memories as the one we saw in 30th century Crystal Tokyo. She mentions that she was reincarnated by Neo Queen Serenity, the future version of Usagi, not Queen Serenity, the mother of Princess Serenity from Silver Millennium. This means that this is not the reincarnation of the Sailor Pluto that died in Silver Millennium, but the reincarnation of the Sailor Pluto which we saw die at the end of the Black Moon story arc. She reincarnated back in time, which may seem silly but in a series in which both reincarnation and time travel exist, it is not unreasonable to assume this to be possible. 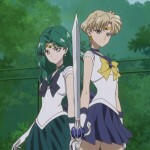 Later it is stated that Sailor Uranus, Neptune and Pluto were reincarnated in the present. But Sailor Uranus and Neptune did not die in the future. We will later learn the specifics but so much to say everyone died when Silver Millennium fell. 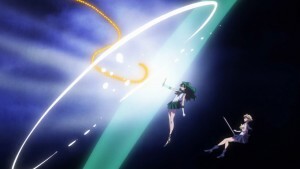 So where did future Sailor Pluto who protects the Space-Time Door in Crystal Tokyo come from originally? She is not the future version of this character but rather the past version. Sailor Pluto in Silver Millennium can’t be the future version of this Sailor Pluto as we see her as a child talking to the original Queen Serenity. Is there a second Sailor Pluto kicking around somewhere right now which was the original reincarnation of the Sailor Pluto which died when Silver Millennium fell, who will live out her long life protecting the Space-Time Door? Sailor Pluto has died twice but as far as we have seen, has been reincarnated only once. She seems to exist outside of time but she is not beyond the causality of life and death. Something just doesn’t add up here. Does anyone have plausible theories as to what is going on? As we’ve seen this new story arc is rich on stock footage but there’s even more recycled animation going on here. As you can see by the above screenshots, one from the first episode of the Infinity story arc, Act 27 Part 1, and the other from this week’s episode, there’s some reuse happening. While Chibiusa’s pose may not be identical in this exact frame look at Diana if you need proof that this is the same. 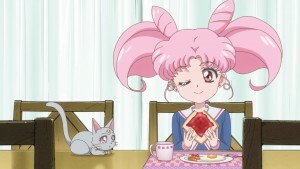 The toast toping and clothes have changes but the rest of the shot is nearly identical right down to Chibiusa’s hands and the furniture. In addition to reused animation this story arc is full of flashbacks to earlier episodes. We even get flashbacks to scenes earlier in the same episode, sometimes only a few minutes apart. Every second of animation costs quite a bit of money. If this process can be tweaked to avoid a few minutes of animation per episode that is an immense cost savings. The animation this season has been terrific but you can’t get something from nothing. It seems that one cost saving measure that has been done is to try to reuse as much animation as possible in a number of ways. It’s important not to be too negative about this. The alternative is a show every second week or poorer quality animation. You know all that drama where we can’t work together? Well everyone is friends now. Yay! The reason for the drama was not ignorance but it seems like Sailor Uranus and Neptune knew what was going on all along! Since they protect the solar system from outside invaders they consider it their job to protect against the Death Busters, a threat from another dimension. So everyone’s cool now? Not quite. 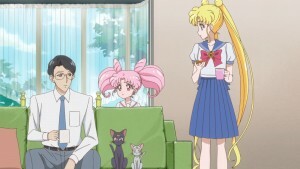 The new guys still don’t want Sailor Moon and her friends to help, and it seems to boil down to not putting her in harm’s way. The drama must continue! 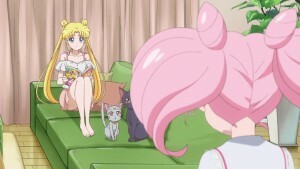 In one scene we see Usagi reading a comic with Sailor V on the cover. The title reads “Nakayoshi”. Codename: Sailor V mostly ran in RunRun but the first issue did appear in Nakayoshi, the magazine which would later run the Sailor Moon comic. Tons of back story on Hotaru this week. 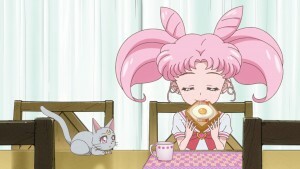 Chibiusa is supposed to meet her for a movie but she can’t make it because she’s undergoing surgery. As excuses to miss a date go, having surgery is a pretty rock solid one. Hotaru is pretty much a cyborg, with all sorts of artificial parts inside her arms and legs. 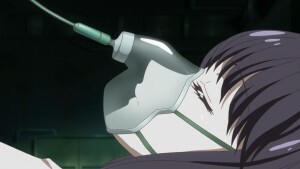 This goes back to an accident which occurred years ago in which Hotaru’s mother died and Hotaru was left at the brink of death, seeming to have been saved only thanks to this surgery. 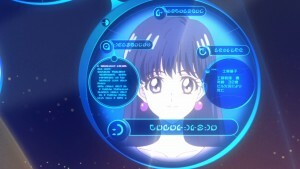 When Chibiusa wants to call Hotaru, she uses a phone number which goes right to her room. Once again we’re adapting something from the 90s which doesn’t fit the world today. I remember having a “kid’s line” which had a different ring at my house. Do people still do this in 2016? I think most people just have cell phones. The eternal struggle of faithful adaptation vs. adapting to fit with the times. Once again Sailor Moon Crystal goes for the faithful adaptation, which I respect, but it creates an inconsistent universe in which these characters live. With four of the Witches 5 down that only leaves Cyprine … or does it? Cyprine of the Witches 5 somehow separates herself into Cyprine and Ptilol, which always makes me wonder why they aren’t called the Witches 6. They go on to say that they are one Witch, something which seems to be an attempt to have their name make some sort of sense. 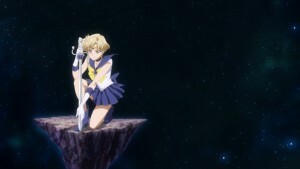 The fight starts with Haruka and so she transforms into Sailor Uranus. 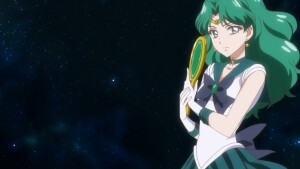 Unfortunately we don’t see Sailor Neptune or Pluto transform, making it increasingly unlikely that we will see a Sailor Pluto transformation sequence in this story arc. We should not abandon all hope though! 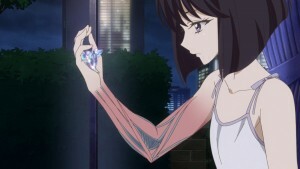 I’m still hoping to see a Sailor Saturn transformation sequence in my lifetime! 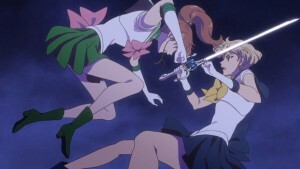 The Sailor Guardians get sort of brainwashed and start fighting each other. They’re not fully controlled but rather their existing negative feelings for each other are amplified and so it’s the Sailor Moon version of Civil War. Nothing like an excuse to have the good guys fight each other! Things get pretty intense in the ensuing fight as the two teams really dish it out against each other in a fairly impressive display. Sailor Moon and Sailor Chibi Moon fail to stop the fighting on their own, which causes Sailor Moon, Sailor Chibi Moon and Tuxedo Mask to unite and create the Holy Grail. It looks a lot like the clay one which they made not long ago. 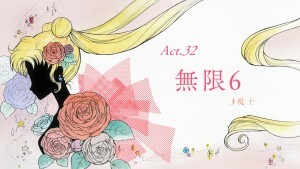 Next week is Act 33, Transformation – Super Sailor Moon, in which the Holy Grail is used to well… have Sailor Moon transform into Super Sailor Moon. 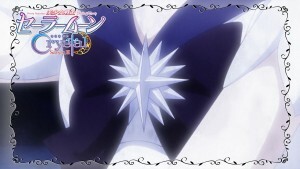 More importantly, as seen from the clips in the preview, we will be getting our first look at Sailor Saturn. Don’t get too excited though. 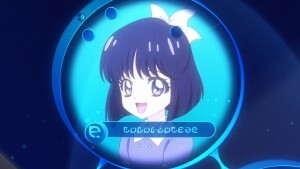 Sailor Saturn will not be appearing in the present. As we can see by the slightly grainy quality to the clips in which we see her bow and boots, this is actually a flashback. This scene is where Sailor Uranus, Neptune and Pluto remember their fateful encounter with Sailor Saturn as Silver Millennium fell. Keep reading for more screenshots from Act 32 and the next episode preview for Act 33. 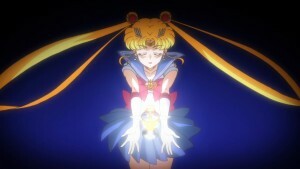 This entry was posted in Codename: Sailor V, Pretty Guardian Sailor Moon Crystal (2014) and tagged Chibiusa, Cyprine, Diana, Holy Grail, Nakayoshi, Ptilol, Sailor Moon Crystal Act 32 - Infinity 6 - Three Guardians, Sailor Moon Crystal Phase 3 - Infinity, Sailor Pluto, Sailor Saturn, Silver Millennium, Space-Time Door by Adam. Bookmark the permalink. Perhaps Dr. Tomoe doesn’t think Hotaru is ready for a cell phone? I mean, she’s in the sixth grade, and that was around the time my mom started trusting me with a cell phone, but only because so many people in my age group were having bar and bat mitzvahs and I needed a way to contact her in case of an emergency. Even then, cell phone use was strictly supervised. And this was when texting was still a new thing with phones, and you couldn’t really explore the Internet with them. Imagine how different it might be with a smartphone and a lonely young girl! And before anyone points out, “What if she has an attack and needs to call for help?”, I think it’s likely Dr. Tomoe fitted her with one of those metal bracelets that signal a medical condition and who to call. Hotaru probably also has some sort of pager to contact him in case of a problem. All of these are cheaper than a smartphone, don’t rack up bills because a young girl is using up so much data and allows him more control, which is something this guy would want with his precious test subject–I mean daughter. This is a good point. She is probably a bit young to have one, especially if he keeps a pretty tight leash on her. 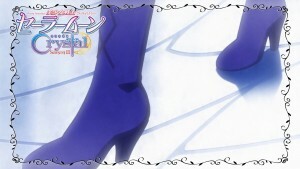 They’re just preparing me for the disappointment of not seeing a Sailor Saturn transformation. Yeah I think the same. Pluto and Saturn’s transformations are something the fans are really really hoping for. And I think we are all preparing ourselves for a huge disappointment, especially for Saturn. Deep inside us, we want to believe something great will happen, but another part of us can’t stop being very pessimistic. I feel like Toei is brilliant when it comes to exciting the fans first and disappointing them just after. This is a hard thing that a lot of Moonies have to deal with ! How can you be disappointed if Saturn’s first transformation is saturn crystal power, make up in the “New soldiers dream” act of 4th “Dream” Arc? She does not have transformation in 3rd arc because she is not daily soldier, she is summoned to just ruin the world and die/reborn… Plus Saturn soul and Hotaru soul are separate souls in manga until they merge in “New soldiers dream”. This is going to get confusing! I think I need an avatar too! I completely agree with Adam. The reasons why they’re not giving us a Pluto transformation, is because they’re not planning on giving us a Saturn tranformation yet. Not until Dream arc that is. 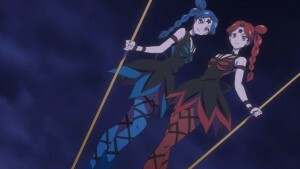 Toei is being lazy, and the recycled art and animations from the most recent release episode, prove my point. I agree of course with Adam’s analysis. And what he points out is really frustrating. 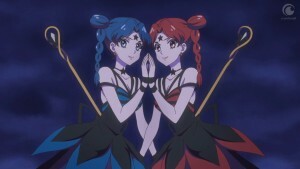 It would have been easy for Toei not to wait until the Dream Arc to give Saturn and Pluto a transformation. Yes, Toei is lazy, and it’s been lazy since the very beginning of Crystal. Adam, by the way, with or without avatar we know when it’s you, since all your posts are coloured in grey . Well, considering that she was mind controled and she didn’t know what she was doing i think that we all can forgive her, right! They left out the part where chibi usa collapsed. I don’t like it when they cut out some parts. This episode itself was okay but compared to the rest of the episodes of season 3 this episode was the worst of the season. The pacing was okay not as good as the previous episode the action was actually good except for the recycling of the same animation footage from the same episode. The execution of this episode was terrible. They are cutting corners and this is just a 13 episode season. It reminds me of the old 90’s anime when they would recycle animation footage from previous episodes or even the same one as if we wouldn’t notice. The animation and character model design dropped a good bit this episode but without the recycled animation footage who knows what would have happened. I mean they were too lazy to even change up Diana’s pose or even give her some shadow or shading. For the battle they reused Uranus trying to cut mars and Jupiter. In that moment it didn’t even make sense that Mars was still standing next to Jupiter. The flashbacks were unnecessary and over used. 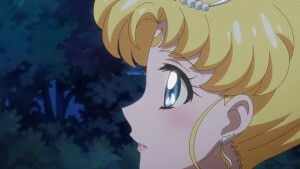 Sailor Moon thinks about the scene that just happened.We should see her actually looking at the scene while thinking and let us get some new battle animation. The lab scene even Pluto feeling that something was wrong with Uranus scene looked all like recycled animation with minor tweaks. I’m sorry but it makes no sense. Most of those animation scenes had barely any motion going they might as well have drawn the scene new. Also I don’t understand why Princess Serenity had her Neo Queen Serenity design, but that is a minor thing compared to the rest of the episode. The battle was started off promising. Then Cyprine bragged about how no one could stop her attacks and blasted the Outer Soldiers. That as very intense, but then Mars uses her now over used stock footage of Mars Snake Fire and just disperses Cyprine’s attack. So much for being the strongest witch of the Witches 5. This happens in the manga too which makes no sense and they could have easily changed it up like the last episode which actually made the battle more intense because none of the attacks were working. It was a moment for Crystal to elevate the scene in which the manga scene just didn’t make sense or was not as interesting. The Outer vs Inner battle was the best part. We finally get Jupiter attacking physically instead of just her magic based attack. I wish there was more of that. Then they started reusing the scenes and having flasbacks of scenes we just saw so the intensity was ruined again. They should have used more real time attacks like when Jupiter attacked Chibi Moon. The stock footage really made the battle less intense. They should have used the outers attacks as stock footage. On the theory of Pluto. 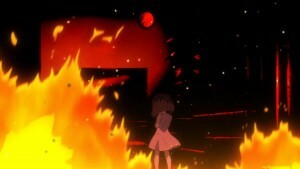 I think Pluto of the future probably was the reincarnated version until she died in the Black Moon Arc. Since she unfortunately had to spend her life guarding the door she was back at the door once again. But after she stopped time and died she was reborn again but this time on earth because she had a new mission and now got to live as a civilian. I think the problem is the fact that pluto had to guard the time door at all. That is why things get confusing because why wouldn’t they have just let someone else guard the time door so she could be reincarnated at the same time as Uranus, Neptune and Saturn(although Saturn should probably be closer to their age in that case and Pluto should be younger). The only disappointment was the fact the Pluto didn’t transform and get her own introduction speech. That was a huge disappointment. They could have easily fit that in the last episode, had they cut sorter some of the stock footage animation for example why do we need to see Moon Spiral Heart attack in full if it wasn’t going to work anyway. Mars snake fire has been overused at this point. I was hoping Pluto would get her own transformation sequence and introductory speech at this point. Unfortunately since crystal does follow the manga closesly and so far hasn’t changed much this season, I doubt Pluto will transform since she never did in the manga. Nor did she formally introduce herself. I blame the manga author. I’ve read the rest of this season of the manga and this really was the last chance for pluto to transform and give her own speech. I agree with you totaly, but what do you think abot Hotarus flashbacks and her cyborg arm ? I might be forgetting some important evidence, but I was assuming that the Sailor Pluto of the Silver Millennium didn’t die because she was busy guarding the Space-Time Gate. Thus, the Sailor Pluto met in the future is the same as the Sailor Pluto of the Silver Millennium, meaning that she only died and reincarnated once. If she’s shown dying alongside Neptune and Uranus in the past though, I guess that theory would be shot down… in which case I’m pretty clueless about where the Space-Time Gate Pluto fits into everything. 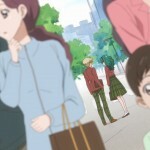 I think they were scanning sites to see how they could fix that plot hole since I don’t recall in the manga where pluto gives that explanation what so ever, and at least im not the only one who could see plain and simple that this was basically stock footage the episode lol, cant wait to see super sailor moon, and how the rest of this arc plays out and hope they tell us that dreams and stars arcs are coming, cant wait to get my blu ray of dark kingdom too, also has anyone heard anything about sailor moon s getting a blu ray release yet?